This easy Butternut Squash Crostini recipe is such a great appetizer for fall entertaining. It’s the perfect Thanksgiving appetizer recipe or could be served on larger slices of bread for a full side. Guests will never believe that this recipe has just four simple ingredients but tastes amazing. A few weeks ago I had the opportunity to visit Napa Valley, California thanks to our sponsor California Prunes. My time there was eating, cooking, and learning about prunes from the farmers that grow the prunes to the chefs and culinary students who work with this local product every day. My time in Napa was a whirlwind from the start. 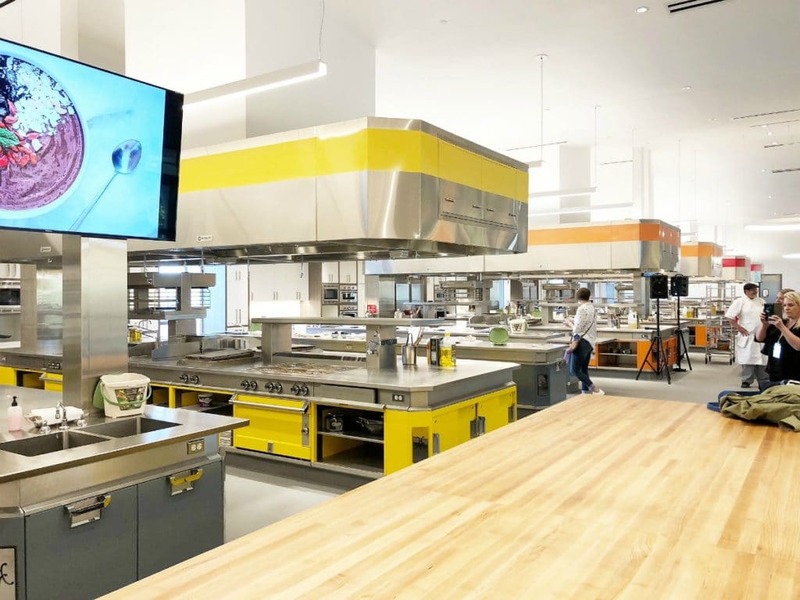 On the first day, I visited not one but two branches of one of the most prestigious and well-respected cooking schools in the country, the Culinary Institute of America (the CIA for foodies). The Copia and Greystone locations are just a quick 45-minute drive apart so it was nice to see the differences between the two. Our first stop was at the Copia location. We learned all about California Prunes and what makes them such unique, high quality, and nutritious. 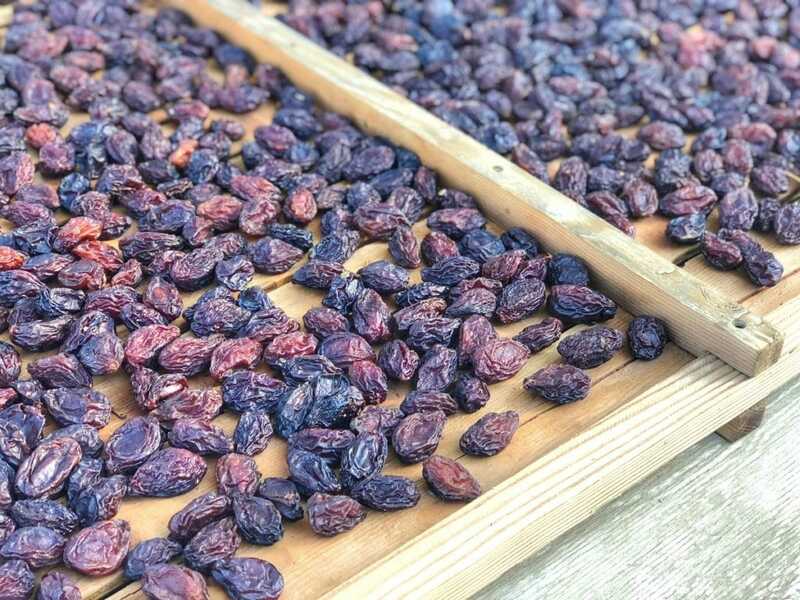 We heard from three local farmers who have been growing prunes for generations in California and a nutritionist that extolled the nutritional and health benefits of adding more prunes to your diet. (1) serving of California prunes (4-5 prunes) has 3 grams of fiber, is just 100 calories, and does not have any fat, sodium, or cholesterol. There is a discussion that prunes: improve absorption of calcium, act as an antioxidant at the cellular level, support healthy bones, and help change gut microbia. The key nutrients in prunes are magnesium, vitamin K, boron, and potassium. Then the real fun began! 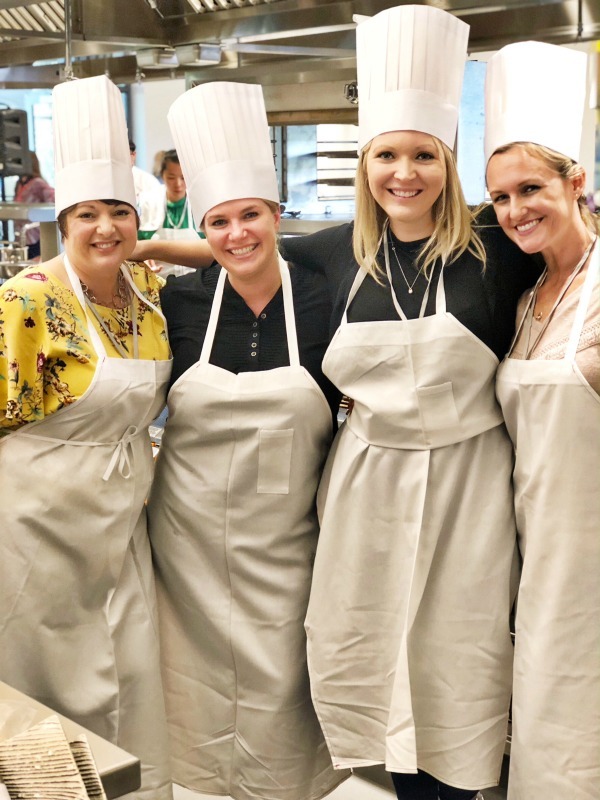 We were placed into teams and were given 30 minutes to create a recipe featuring prunes using all of the amazing equipment and fresh ingredients at the CIA. We ended up making a delicious orzo risotto with a topping of walnuts, lemon juice, pancetta, garlic, and you guessed it…prunes. For both lunch and dinner, we were served full courses where prunes were featured in each dish. Savory or sweet, somehow prunes complimented everything from lamb to dessert. Before heading back home we visited an orchard where California prunes are grown. 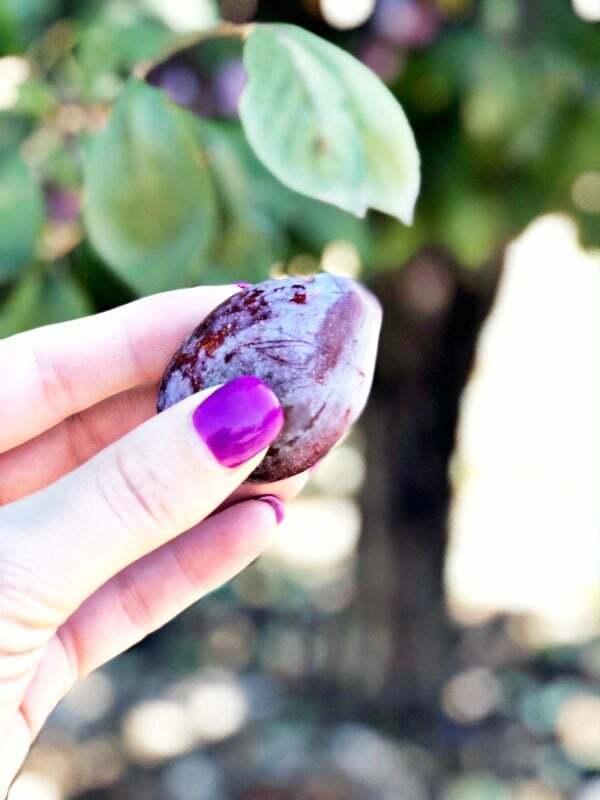 We were able to see firsthand how harvesting is done and learned the process of turning plums into prunes. To be completely honest, aside from feeding my kids prunes when they were constipated as babies I didn’t have any real experience before this trip. Sure, I remember my mom and grandma eating prunes or drinking prune juice to move things along but not really enjoying them. But after this trip and really getting a first-hand look at California prunes, I have to say my opinion has definitely changed. 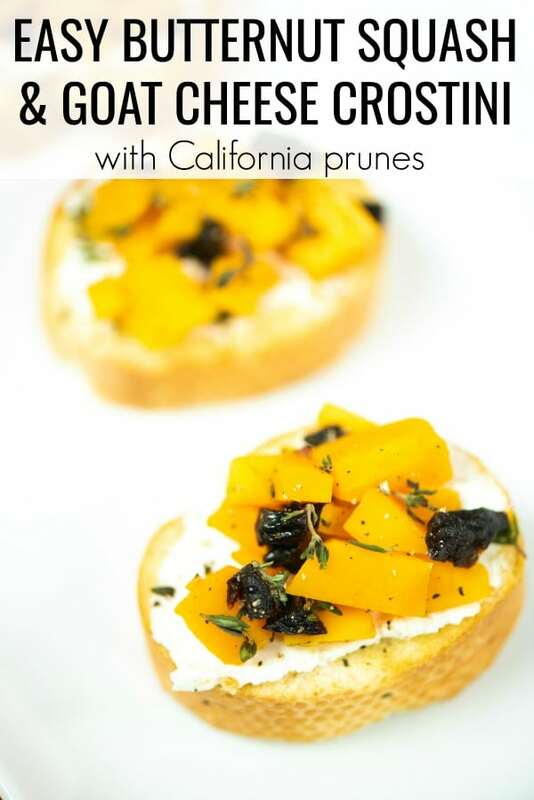 Y’all know how much I love me an easy appetizer recipe, so when I got back from Napa I created this easy butternut squash crostini recipe as a way to add some prunes into my family’s diet and hopefully change how you think about prunes too! What’s the difference between crostini and bruschetta? It’s all about the bread. Bruschetta is made using wider, larger slices of bread while crostini is smaller slices from a baguette. Roasting butternut squash is way easier than it seems. Just cut off each end, split in half and then half again. Place it on a baking sheet drizzled with olive oil and sprinkled with salt and pepper. Then toss it in a preheated oven at 400 degrees for 25-30 minutes. Taking off the skin is super easy once you’re done and you should be able to cut it straight off. This easy Butternut Squash Crostini recipe is such great appetizer for fall entertaining. It's the perfect Thanksgiving appetizer recipe or could be served on larger slices of bread for a full side. Guests will never believe that this recipe has just four simple ingredients but tastes amazing. Place butternut squash pieces on baking sheet. Drizzle or spray pieces with olive oil and salt and pepper to taste. Bake in preheated oven for 25-30 minutes total. Spread baguette slices out on baking sheet, drizzle or spray tops with olive oil, and season with salt and pepper. Add to top rack of preheated oven when butternut squash has 10 minutes remaining. Allow to brown and get color on tops. Peel and dice the butternut squash into small pieces then add prunes and thyme mixing together. Squeeze lemon juice on mix and season with salt and pepper. 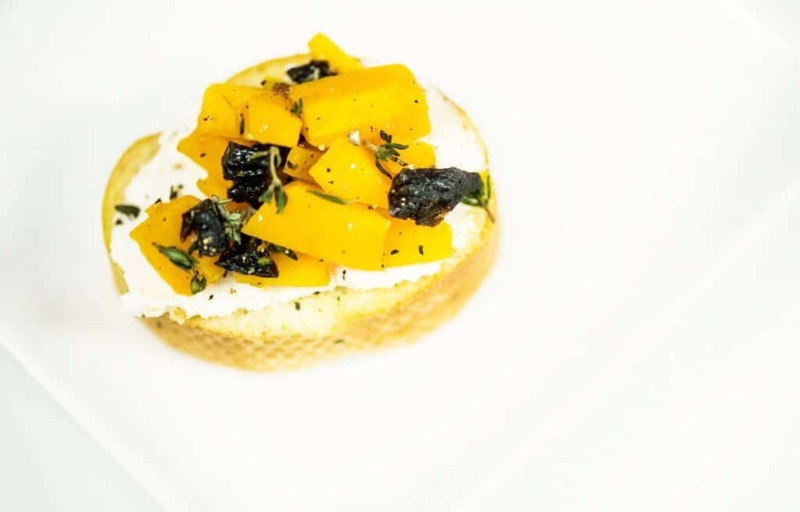 Spread a thin layer of the softened goat cheese onto each slice of baguette, then top with butternut squash/prune mix. Have you tried cooking with prunes before? What’s your favorite recipe? Let’s continue this conversation on Facebook! And while you’re over there make sure you follow California Prunes! 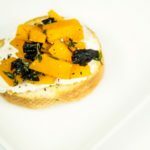 Don’t forget to pin this easy butternut squash crostini recipe for later! Make sure to check back when I combine butternut squash and prunes later this month into a delicious Thanksgiving side dish!